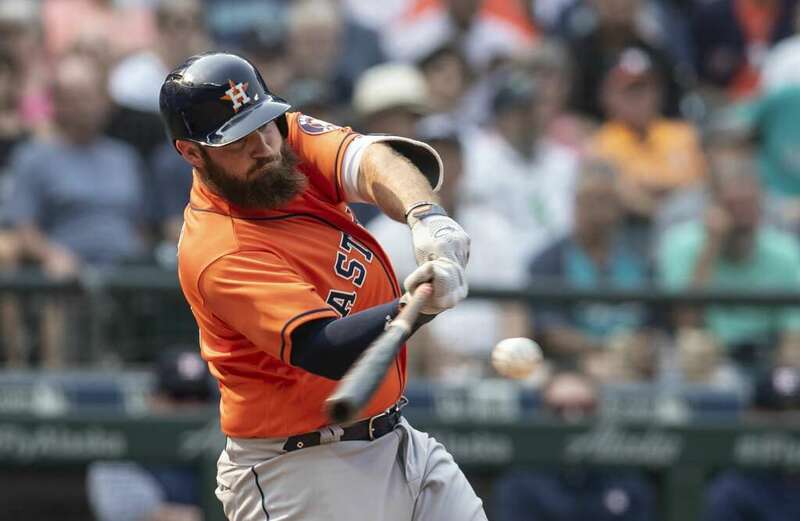 The Astros built an 8-0 lead in Seattle on Wednesday then held on for a 10-7 triumph that reclaimed sole possession of first place in the American League West. Were these the same Astros that had suffered two-hitters and five-hitters earlier in the road trip? Houston socked 17 hits with six players, including infielder Jose Altuve in his second game back from the disabled list, posting multi-hit afternoons. Tyler White opened the scoring in the first with a triple off the left field wall that plated Carlos Correa. A wild pitch by Marco Gonzales brought him in for a 2-0 lead. Martin Maldonado singled in the second to drive home Yuli Gurriel. Maldonado, who seemingly loves hitting in the Pacific time zone, sliced an opposite field double in the fourth to again score Gurriel but that was just the beginning. Tony Kemp, Alex Bregman and Altuve all slapped singles before Correa launched a sacrifice fly to complete a five-run rally and hike the lead to 8-0. Charlie Morton had made it through the first three frames scoreless but Nelson Cruz took him deep in the fourth and Robinson Cano doubled home a run in the fifth before the Mariners launched a five-run rally of their own in the sixth to get within two. Maldonado and White each smashed solo homers, their eighth of the year and third hit of the day, to complete Houston's scoring while a quintet of relievers effectively pitched the final four innings as Roberto Osuna earned his first save as an Astro. The Astros get a break Thursday while traveling back to California. On Friday, they will start a weekend series in Anaheim to complete their nine-game road trip out west. A pair of southpaws will get it started as Dallas Keuchel (9-10) will battle it out with Andrew Heaney (7-7) in a 9:07 pm CT contest. Oakland begins a four-game series against faltering Minnesota on Thursday. Speaking of schedules, the full 2019 MLB schedule was released Wednesday (be prepared for a some tweaking this far ahead) which will feature our old rival NL Central teams in interleague action. The campaign begins March 28th with a four-game series at St. Petersburg against Tampa Bay and end with a four-game series in Anaheim at the end of September. The Astros and Angels will play a two-game series, May 4th-5th, in Monterrey, Mexico. Houston's home opener will be April 5th against Oakland.